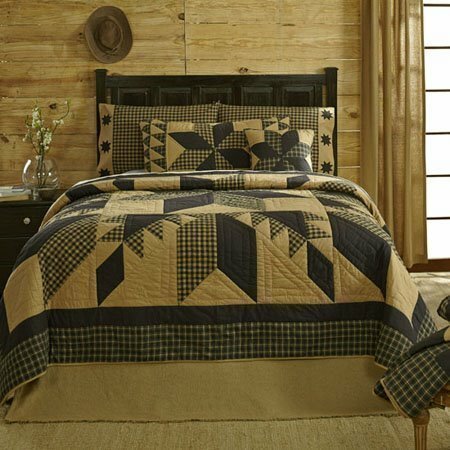 Dakota Star Twin Quilt Set by VHC Brands - P.C. Fallon Co. The Dakota Star Twin Quilt Set includes one twin quilt, one twin Burlap Natural Fringed bedskirt, and one standard sham. The twin quilt measures measures 86"L x 68"W. The bedskirt measures 39" x 76" with a 16" drop. The standard sham measures 21" x 27". The Dakota Star collection is black and khaki, featuring a traditional 8 point star in the center, surrounded by a feathered star quilted pattern. The star is made of checks and solids and is bordered in a black and khaki plaid with khaki binding trim. On the back of the quilt is a solid khaki fabric. The quilt has a 100% cotton shell and fill and is hand quilted with stitch in the ditch and echo quilting. This item is imported. Please note, colors may appear differently in different resolutions and on different computers. Machine wash, gentle cycle. From The Ashton & Willow Line made by VHC Brands.